Nature Scribe: Death By Scenery? Otago is a dangerous place. Stretching from Dunedin to Mount Aspiring in New Zealand’s South Island, its diverse yet consistently stunning scenery is so compelling that driving can be quite perilous. How are you supposed to keep your eyes on the road when the province’s wide skies, blue lakes, high tawny hills and higher slabby mountains keep demanding your attention? Why is there no tourist guide entitled “Death By Scenery”?! And it’s not just drivers who are endangered. The same scenery seeps into the soul of walkers, climbers, cyclists, anglers, skiers, kayakers, and all lovers of the outdoors. Whatever the season, whatever the weather, it never quite stops calling you – be it in a whisper or a shout – go out, go up! 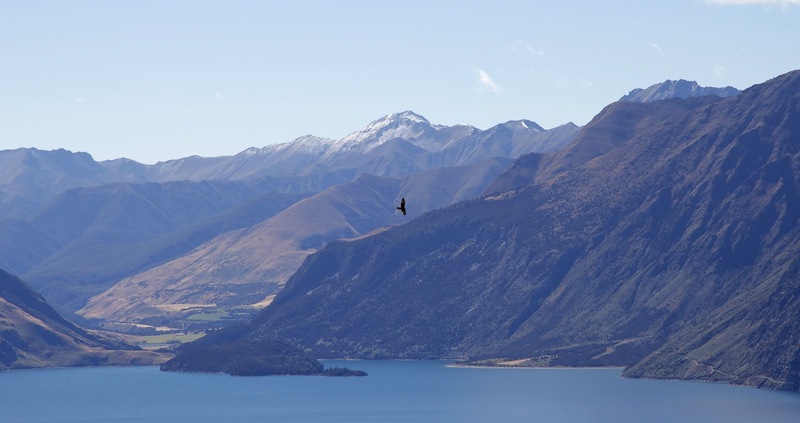 We’d gone to Lake Hawea in north-west Otago for some down time. I’ve finally learned not to be surprised at how long it can take to recover from a big walk. There are aches and pains caused by the toxins that build up in muscles during exertion. There’s also the inevitable dehydration, no matter how much you’ve tried to keep up your fluid intake while walking. And that diet of freeze-dried meals, dry biscuits and scroggin has its effects too. My digestive system usually takes a while to recalibrate itself to things fresh, green and fruity. Similarly with my psyche. It too needs time to process all the amazements of a good walk. We were in New Zealand for nearly a month. So after our time on Stewart Island and the Greenstone/Caples Track (see posts here & following), we’d planned a week in a bach (ie a shack or holiday house) at Lake Hawea to give our bodies and souls some recovery time. South Islanders say Hawea today is what Wanaka was a few decades back; a small village with basic facilities in an achingly beautiful lakeside setting. And there’s the rub. 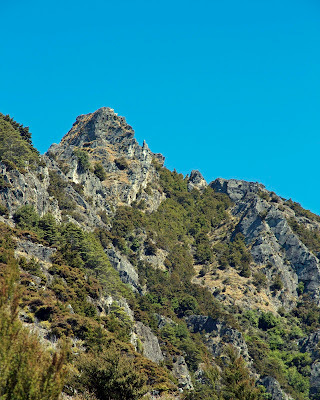 While I love to relax, and enjoying reading, going out for coffee, or tucking into the excellent produce of Otago, after a few days in this setting the siren call of the hills becomes a banshee wail. It didn’t help that our bach had superb views over the lake towards 2,000m mountains. Nor that our bodies were feeling fit, and wondering where all this indolence was leading. So when the clearest of blue-skied days arrived, we found ourselves having a “leg stretch”. 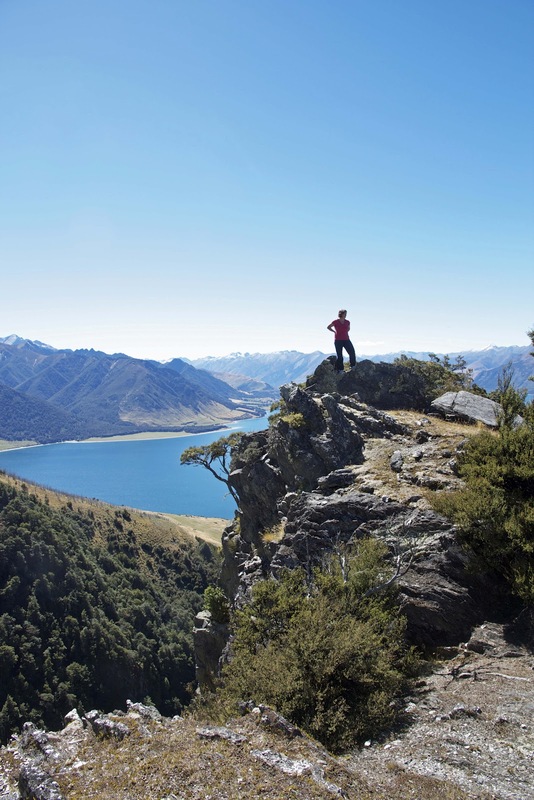 Isthmus Peak, a mere 1,385m, seemed a suitably modest target, promising views over both Lake Hawea and Lake Wanaka. As we wound our way towards the tussocky heights, we struck two problems. First there was some ambiguity about the time the walk would take. Was it 3-4 hours each way, or 3-4 hours return? We’d only allowed time for the latter. And then we noticed a small convoy of 4WD vehicles winding up a steep farm track well ahead of us. We guessed they too were headed for Isthmus Peak. We felt cheated! The thought of expending all that effort walking, only to arrive at a peak that others had driven to, was galling. We sat down for a drink and a think. We had a grandstand view over a high country stations to the lake and the ranges surrounding it. In the distance, at least a kilometre below us, a farmer and his dogs were rounding up cattle. We could just hear him whistling, tooting his ute’s horn and calling, while cows mooed and dogs barked. We smiled at the idyllic scene: hard and honest labour in a sublime setting. But as we watched, the farmer suddenly shouted at one of the dogs. In a clearly audible voice, adding a short Germanic expletive to the word “idiot”, he made it clear he wasn’t impressed with the dog! We nearly fell off our lofty perches laughing, our bubble of bucolic bliss having burst. The laughter somehow helped us to make up our minds. Rather than going for the named peak, we would leave the marked track and head straight up towards a nearer rocky eminence. When I pointed out that it lacked a name, Lynne helpfully suggested that we could call it “Grants Knob”. More laughter and some lung-heaving work eventually saw us top out on the newly named “peak”. 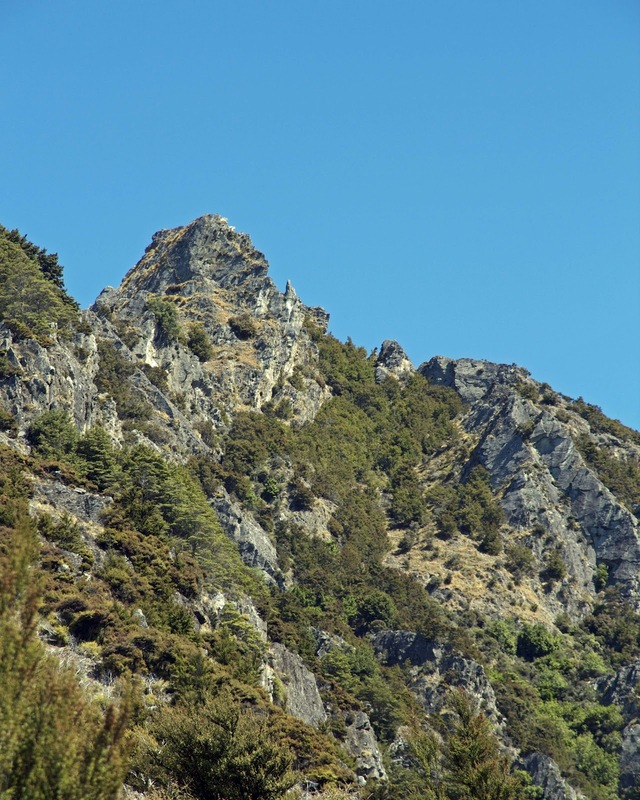 While these words from Otago writer Brian Turner show us we were not the first to find such a place on such a day, we truly felt that we were. In youth I would have been restless to “bag” the peak. But now, in a setting like this, going further than our own private peak would have felt perverse. Now was the kind of time you would recall for as long as you told tales of wonderful times in wondrous places.